She graduated from high school in Kalamazoo, MI. Her father was a firefighter and her mother, a librarian. Both of her parents and older brother still reside in Kalamazoo and her younger sister lives in Colorado. When she was 18, she was diagnosed with scoliosis and underwent the corrective surgery to permanently implant a Harrington rod, effectively fusing her spine from mid-thorax through the lumbar. On a partial academic scholarship from Kalamazoo College, she worked during the week and weekends, as a waitress and restaurant receptionist, to pay for the balance of her education. After graduating from Western Michigan University with her Bachelor of Science degree in Psychology and Education, she was licensed and pursued a career in teaching High School in the Michigan Independent School District, specializing in Math, English and History. She then moved to Dallas, Texas, where she was employed as a teacher in the Psychiatric Unit at the Baylor University Medical Center. She entered the corporate world with SONY Electronics, Inc. in 1989. During her career, she achieved the coveted Samari Award for excellence in sales as a Broadcast Sales Engineer and resigned 14 years later to pursue her Doctorate in Psychology. She first married in 1987 and lost her husband, Ansis Veiland, when he died of cancer in 2001. She fell in love and was married to Garth F. James in Florence, Italy in 2003. 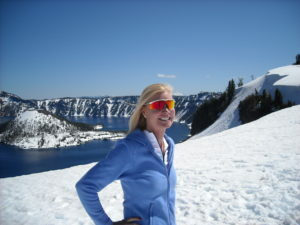 Her other pursuits, which she shares with her husband, are travel, scuba diving, cycling in Italy and France and golf. Her other interests and talents are turned to playing classical piano, pilates, writing, reading, research and her professional career, where she is the President/CEO of Life Consultants. Dr. James has given numerous television and radio interviews with local, national and international reach on a variety of psychological issues.